"SUMGAIT WAS THE CONTINUATION OF BAKU'S UNRELENTING POLICY OF PERSECUTION"
Heritage faction has issued a statement on the 23rd anniversary of the Sumgait pogroms. "Today marks the 23rd anniversary of the Armenian genocide that took place in the Azerbaijani town of Sumgait. Using as a pretext the peaceful and lawful struggle of the people of Mountainous Karabagh (Artsakh), who had stood up for their right of self-determination and security, the Soviet Azerbaijani regime organized and carried out in 1988 a horrific operation geared toward the physical annihilation of its Armenian residents. And as a result of this action, hundreds of Armenians were either killed or maimed, and tens of thousands were forcibly deported toward Armenia and other republics of the former USSR. But this crime committed in Sumgait was just the continuation of official Baku's unrelenting policy of persecution against, and the ethnic cleansing of, the Armenian population which, as a consequence of Stalin's illegal decision, had found itself-and its indigenous lands-within the administrative structure of Soviet Azerbaijan. Indeed, it was because of this policy that the ancestral Armenian heartland of Nakhichevan was left completely devoid of its native Armenian population, whereas in Artsakh the absolute preponderance of the Armenian majority had rapidly decreased. Yet this policy signified a mere beginning of an ongoing genocide, which resulted in the large-scale killing and exile of hundreds of thousands of Armenians throughout the land-from Baku to Armenian Gandzak. Together with Sumgait and its military aggression against Artsakh, the now-independent Azerbaijan once more demonstrated its genocidal nature and proved that Artsakh can never, and under no status, be a part of that country because that will simply jeopardize the security of the Armenian population. A state according to which the solution of its purported citizens' grievances and the fulfillment of their rights lies in their physical extermination and forcible expulsion has no right to lay hegemonic claims upon Artsakh. And as for the international community-and the grand powers in particular-which has left the people of Artsakh all alone against Azerbaijani state aggression, today it has no right to demand that Artsakh give up its political independence and territorial integrity, which it achieved lawfully and owing to its last stand of self-defense. Instead, they are obliged to register and recognize that sovereignty and integrity to be in full compliance with the letter and spirit of international law. February 28, 2011 - 19:10 AMT 15:10 GMTPanARMENIAN.Net - The head of the department on work with law-enforcement bodies of the Azerbaijani President’s Administration of the President, Fuad Aleskerov said that the Azerbaijani leadership states that the Armenian pogroms in Sumgait in 1988 were organized by Armenian nationalists and their promoters – Mikhail Gorbachev and USSR KGB. At the same time Aleskerov tried to lay the blame for the events in Sumgait also on the Armenian side, saying that the “Armenian nationalists” allegedly have been trying to justify Armenia’s actions against Azerbaijan for many years. Aleskerov also stated that Azerbaijan possesses the so-called facts, which prove that the Armenian pogroms in Sumgait were organized by Armenian nationalists and their promoters – Mikhail Gorbachev and USSR KGB, 1news.az reported. February 28, 2011 - 18:21 AMT 14:21 GMTPanARMENIAN.Net - Syria commemorated pogroms of Armenians in Sumgait. On February 27, liturgies in memory of victims of the Sumgait pogroms were served in the Armenian churches of Syria. Armenian consul general to Aleppo Ashot Manukyan, employees of the consulate and representatives of the Armenian community of the city participated in the commemoration events. At the initiative of the Armenian embassy in Damaskus, a liturgy dedicated to the 23rd anniversary of the Sumgait massacres was served in St. Sargis Armenian Church on February 27. Armenian Ambassador to Syria Arshak Poladyan and representatives of the Armenian community participated in the event, the RA MFA press service reported. 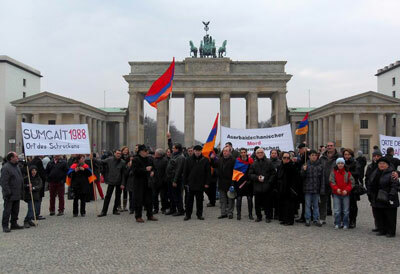 February 28, 2011 - 18:04 AMT 14:04 GMTPanARMENIAN.Net - On February 27, a rally and procession to commemorate the Sumgait pogroms was held in Berlin. The rally was held by NKR Permanent Representative to Germany Harutyun Grigoryan in cooperation with the Central Council of Armenians of Germany through the assistance of the Armenian Apostolic Church. The NKR Permanent Representative and activists of the Armenian Diaspora of Germany urged the European community to condemn the cruel actions and aggressive policy of the Azerbaijani leadership and not to turn aside from the Sumgait tragedy. Participants of the event disseminated leaflets in German, English and Russian languages among European citizens. Later, participants of the event attended a liturgy served in memory of Armenians killed in Sumgait. February 28, 2011 - 18:46 AMT 14:46 GMTPanARMENIAN.Net - At Beirut’s Armenian Church, the Catholicos of the Great House of Cilicia, Aram I served a liturgy for the victims of Sumgait massacres. The liturgy was followed by speeches delivered by the Catholicos and the Armenian Ambassador to Lebanon. They noted that the international community failed to give adequate political and legal assessment to Sumgait tragedy. They characterized Karabakh, which earned its right for freedom at the price of its people’s blood, as an independent state. Parliamentarians, guests from NKR, representatives of Lebanon’s Armenian community participated in the event. Twenty-five years ago, the seaside town of Sumgait in Azerbaijan, then part of the Soviet Union, became the scene of bloody anti-Armenian riots in which at least 32 ethnic Armenians were killed, according to the official estimates, although some sources say that the real figure is much higher, the article of The Voice of Russia reads. Radio station says, that a week before the riots, on February 20, 1988, the parliament of the Nagorno-Karabakh Autonomous Region with the predominately Armenian population petitioned to Moscow to be allowed to reunite with Armenia. That was the beginning of the ongoing territorial dispute over Nagorno-Karabakh, which led to a full-scale war between Armenia and Azerbaijan in 1991-1994. When the Sumgait pogroms broke out, the authorities first branded them as hooliganism and did not intervene. Troops were brought in only the following day but observed neutrality until they themselves were attacked by rioters. Tougher measures followed. The riots were quelled and a curfew imposed. Within days, however, anti-Armenian violence swept Baku, Kirovabad, Hanlar and other Azerbaijani cities. The conflict snowballed and in 1990 the Karabakh war began. The article says that tens of thousands were killed and hundreds of thousands became refugees. In May 1994, an indefinite ceasefire was signed, putting an end to the bloodshed. A quarter of a century since, that ceasefire still holds. The Sumgait events were the first symptoms of the looming collapse of the USSR, says Alexander Krylov, a Caucasus expert at the Institute of World Economy and International Relations. "The central government was in a deep crisis and losing control at all levels – republican, regional and nationwide. And bursting from beneath were destructive processes as nationalistic-minded forces sought to achieve their goals. In Azerbaijan, it led to violence in Sumgait and other cities." Political scientist Stanislav Tarasov thinks that Nagorno-Karabakh conflict can be resolved, though not in the near future. "There were other forces playing in the region and destabilizing the situation. And now a solution looks more promising than ever. The first scenario is that both sides will demonstrate good will and opt for peaceful coexistence. But the current policies of Armenia and Azerbaijan make that scenario unlikely. It is also possible that, given the geopolitical fragmentation of the region, the independence of Nagorno-Karabakh may, after all, eventually be recognized." The Voice of Russia says that the Sumgait tragedy was mentioned at a UN Security Council meeting this week. Top UN officials highlighted the need for joint efforts to protect civilian in armed conflicts. The Armenian side reaffirmed its commitment to settling the Karabakh conflict peacefully and in keeping with international law. On February 27 protests which were attended by hundreds of rioters turned into violence. Armed with axes, knives, specially sharpened rebar, rocks and cans of gasoline and with the pre-compiled lists of apartments where Armenians lived the rioters broke into the houses, turning everything upside down there and killing the owners. In the same time, people were often taken out to the streets or to the courtyard for jeering at them publicly. After painful humiliations and torture the victims were doused with gasoline and burnt alive. On February 29 army troops entered Sumgait but without an order to intervene. Only in the evening, when the mad crowd began to attack the soldiers the military units took up decisive steps. The exact number of victims of Sumgait pogroms is still unknown. According to official data, 32 people were killed; however there is ample evidence that several hundred Armenians have been killed in the city in three days. There is also evidence that the riots were coordinated by KGB in Azerbaijan. Executioners of Sumgait were subsequently declared as national heroes of Azerbaijan. Edited by Yervant1, 28 February 2013 - 09:15 AM. Antero Leitzinger http://en.wikipedia....tero_Leitzinger, "scum of the Earth" would be an understatement. Thomas Goltz, no need for further explanation. Yesterday, the representatives of the Armenian community in the U.S. held a protest at the Azerbaijani Consulate General in Los Angeles in connection with the 26th commemoration of the Sumgait massacre and the 10th anniversary of the axe murder of Gurgen Margaryan, reads the "Asbarez" publication. The rally was organized by the Unified Young Armenians and aimed to inform the international community about the horrors inflicted on Armenians by the Azerbaijanis. Anti-Armenian policies of Azerbaijan hadn’t stop since Sumgait pogroms, and glorification of Gurgen Margaryan’s murderer – Ramil Safarov, is a proof for this. One of the speakers, David Arakelyan, condemned the Azerbaijani authorities for anti-Armenian policy, and the international community for its silence, which allows Azerbaijan to continue its aggression against the Armenians of Nagorno-Karabakh, "Asbarez" writes. In 2004, Armenian officer Gurgen Margaryan was taking part in a three-month English course of NATO “Partnership for Peace” in Budapest. Early in the morning of February 19 he was murdered. The murderer – Azerbaijani officer Ramil Safarov - delivered 16 blows of ax to the face of the sleeping Armenian officer. As a result, the Hungarian court found him sane and sentenced him to life imprisonment without a right of pardon for 30 years. The news about the extradition of Ramil Safarov to his homeland and pardon by the Azerbaijani president Ilham Aliyev broke out on August 31. The pardoned murderer Ramil Safarov was greeted as a hero in Azerbaijan; he was given an apartment and was paid an officer salary for 8 years spent in detention. Moreover, Safarov was breveted Major by the Minister of Defense of Azerbaijan, who also wished him "every success." Because of Safarov’s extradition to Azerbaijan the president of Armenia Serzh Sargsyan announced the suspension of diplomatic relations with Hungary. Safarov’s extradition, pardon, and glorification in Azerbaijan was condemned by the US president Barack Obama, US State Department, Ministries of Foreign Affairs of Russia and France, Secretary General of Council of Europe, Secretary General of CSTO, NATO, and international human rights organizations. In addition to that, European Parliament adopted a condemning resolution on September 13, 2012. 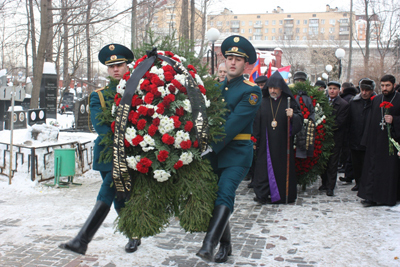 On February 19, is the 10th anniversary of commemoration of Armenian officer’s death. To the 10th anniversary of Gurgen Margaryan’s murder in the frameworks of the "Ordinary Genocide" project a video-footage has been prepared called "Azerbaijan: Racism without borders." The video footage is in English , Russian and Hungarian. It concisely presents the history of the murder that had stunned the world, as well as the programs following the incident and Safarov’s glorification in Azerbaijan.It is significant that the authors chose Symphony number 7 ("Leningrad") by Dmitri Shostakovich known as "the invasion of the Nazis" as a soundtrack for the footage. The "Ordinary Genocide" project is being implemented by the Information and Public Relations Center under the RA President’s administration. showing respect to our fallen hero Gurgen Margaryan RIP!! Panorama.am has already reported that in the frameworks of the project "Ordinary Genocide" the second volume of the collection of "Sumgait tragedy: Eyewitness Accounts” is planned to be published. According to the project manager Marina Grigoryan, publication of the second volume is the continuation of the work that was started immediately after the genocide in Sumgait. At that time, under the supervision of Samvel Shahmuradyan, the testimonies of those who had suffered directly, lost relatives and survived through the terrible tragedy were collected and published. The first volume of the collection was published back in 1989; it was translated into nine languages and was re-released last year. According to Marina Grigoryan, evidences of more than 50 people, written both 25 years ago and recently have been depicted in the second volume. Besides, the collection includes several newspaper articles dedicated to "Sumgait" and published in the Soviet and world press in different years. The book will come out in Russian in late March. Marina Grigoryan also noted that the third volume is to be prepared; it will include materials of criminal cases on Sumgait events, as well as the indictment of the USSR Prosecutor's Office of Azerbaijan on the case which was being investigated by the Supreme Court of the USSR in October-November 1988. In connection with the 26th anniversary of the Armenian genocide in Sumgait Panorama.am continues publishing some of the most terrible and tragic episodes of Sumgait that have been included in the second volume-Brutal simultaneous murder of the brothers Albert and Valeriy Avanesyans. On February 26, protests started to take place in the town. Thousands of Azerbaijanis gathered at Lenin Street, in the square. Almost half of the town was there. They were openly speaking and shouting, “Down with Armenians”. That same night the attacks on Armenian departments began. I myself witnessed how they overturned a car with the driver inside and then burnt it together with the driver. The car was burning. Everyone saw that. The Police were standing and simply watching. The Police during those days didn’t intervene at all; they pretended that nothing was happening as if being afraid of thugs themselves. I was told that frequently the police told the bandits where Armenian houses were and sent them there. The facts prove that everything was planned beforehand. The bandits stood at the streets, stopped the cars and if the driver was an Armenian they dragged him out of the car and started to beat, slaughter, kill but if the driver was an Azerbaijani they allowed him to go. The Azerbaijanis, on the first day, were warned to turn off lights in the apartments, while on the second day ordered to keep lights switched on as the Armenians started to turn off their lights. In that way they learnt where Armenians were living and were Azerbaijanis. I saw with my own eyes how they were walking with a list on their hands and one of them was reading: in such house and on such floor an Armenian was living. Then they started to go from entrance to entrance in different groups. For instance when they learnt that an Armenian was living on the second floor, 20-25 people were sent there. There were 24 apartments in our house; in 7 of them Armenians were living. Our neighbors learnt and informed us that at night bandits would break into the house. One Armenian young man went to a military unit and made a deal to take all the Armenians of our house there. At night around three o’clock the bandits tried to attack the military unit but didn’t manage to do that. In the morning the commander called to the town committee of the party and told them that Armenian refugees are in their unit but they couldn’t t keep us in military unit. We were taken to the town committee by the guards. We spent there a day and then we were driven out. We were simply required to leave the place. They formed a corridor on the road, on both sides of which were tanks. By that road we, guarded by paratroopers, were transferred to the club on the opposite side of the road. There, we somehow settled on the floor. On the following morning I learnt from my Azerbaijani friends that my wife’s brothers (Albert and Valeriy Avanesyan, 32 and 30 years old respectively) were lying dead in front of their house. I went there with my friend on his car. The corpses were not in the yard anymore, they had been taken to the morgue. Their father and mother, themselves beaten, were sitting in the yard and crying. I learnt about the circumstances of the murder from them. It was impossible to enter their apartment: there was already nothing there: everything was destroyed. The parents told me that the bandits entered their apartment at night. Their sons were struggling, trying to keep the door closed but didn’t manage to do that as the amount of bandits were high: 50-60 people, armed with crowbars, stones, fittings. And it was there where the children saved their parents. They sent them to the third floor, to the Russian neighbors while themselves went into the yard to distract the bandits. If they had gone to the neighbors as well, the bandits would have followed and killed all of them. One of the brothers ran in one direction and the other into another, while the bandits split into two groups (15-20 people) and followed them. The neighbors were sting on the third floor and looking how they slaughtered the boys. The neighbors told that the bandits threw stones on the brothers then started to spurn their faces, their bodies. They hit Alik’s head by a crowbar then started to beat with a knife and then poured water on his face to see whether he was alive or not. When he regained consciousness, came to himself a little bit, they started to finish off with him: threw stones on him, spurned him….So, they killed him right on front of the house entrance. The neighbors called police three times and they were told that police would be there soon. However, the police came only in four- five hours. Then, I went to morgue and saw how the murdered laid stacked on each other. There were many naked people, many women with cropped hair, young girls completely shaved. It was clear that the bandits scoffed at them, cut their hair in the apartments and then took them out into the yard. I saw about 18 corpses in the morgue. The day following I went back to take the bodies of the boys but I was not allowed. I was told that the bodies had been taken to Baku. All the bodies in the morgue were mutilated and desecrated; particularly the heads and faces were seriously damaged. The bandits beat especially that parts of the body so as the blood would pour over the face and it would become impossible to recognize the bodies. Judging by the wounds those people were beaten by stones, pipes, crowbars, iron cables. In the club I heard that about 600 people were killed, while recently I learnt about 310. A countryman came to me from Sumgait and told me that in the town committee they saw the list with the names of 310 killed Armenians. Panorama.am doesn’t publish the photos of murdered Albert and Valeriy Avanesyans for ethical reasons. Additional materials and photos are available on the website karabakhrecords.info. a series of hostile acts against the Armenian people. Azerbaijan has sought to cover up these crimes and rewrite history. the work towards peace in the region continues. oppression and violence just because of their ethnicity. understanding and security through the Caucasus region. causing Armenian families like his to flee their homes for safety. against the Armenian residents of Sumgait in then-Soviet Azerbaijan. that hundreds were murdered and injured as a result of the pogrom. help from Armenians were ignored by local police and city officials. three days before Soviet troops were able to put an end to the pogrom. events and ensure they do not happen again. the protection of Artsakh from coercion. by Azerbaijan's government against the Republic of Nagorno Karabakh. and mourning of this unspeakable tragedy. still seek resolution and justice. the Sumgait Pogrom must not be forgotten. In late February 1988, large-scale massacres because of ethnicity were committed in Sumgait, Azerbaijan. On February 27 of that year, the situation went out of control in this town, which is just 25 kilometers from the Azerbaijani capital city of Baku. Several thousand Azerbaijani nationalists started burning the homes of the local Armenian population and killing the homeowners. According to official data alone, 32 Armenian residents of Sumgait were killed, and hundreds of others suffered severe injuries and became disabled. The February 27-29, 1988 Sumgait pogroms, about which Azerbaijan is silent to this day, were the first harbingers of the Azerbaijani neo-fascism. These massacres were followed by the Azerbaijanis’ pogroms of the Armenians in Kirovabad—today’s Ganja—and in Baku, deportation of the entire Armenian population in Shahumyan Region, and incitement to war; all in response to the Nagorno-Karabakh (Artsakh) people’s demand to exercise their right to self-determination. 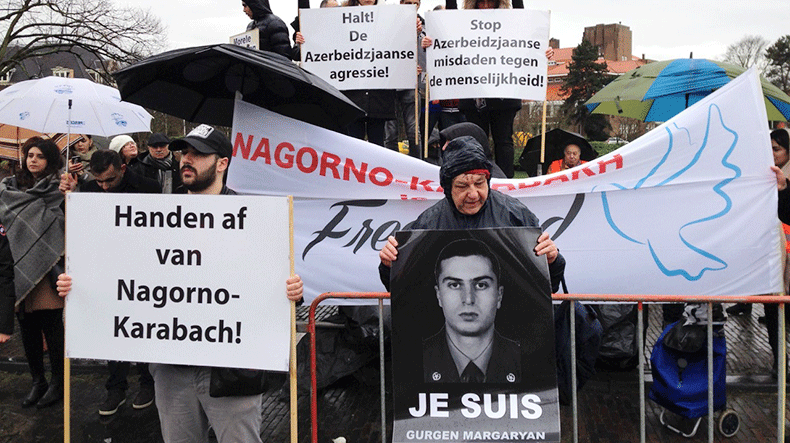 The Joint Armenian Organization held a big protest in front of the Azerbaijani embassy in The Hague in memory of the victims of the pogroms in Sumgait and other Azerbaijani cities in 1988, the Organization reports. The Deputy Director of Europe Department of the Dutch Ministry of Foreign Affairs, Adriaan Palm, met the delegation of the Joint Armenian Organization in the Netherlands. Reportedly, the traditional demonstration took place despite the extremely adverse weather conditions. Many Armenians protested against Azerbaijan’s anti-Armenian policy. According to the information, the delegation handed Palm a letter addressed to the Dutch Foreign Minister Bert Koenders. During the meeting, the deputy director and the Armenian delegation discussed many important issues, including the last escalation of the Karabakh conflict. In the letter, the Dutch government is asked to participate in the prevention of a large-scale war in the Karabakh conflict area and to make an effort in order to achieve the peaceful resolution of the conflict, whether on its own initiative, or at EU level. “First of all, this depends on the observance of the ceasefire, which is regularly violated by Azerbaijan and cannot be established without the presence of international observers,” the letter reads. Besides, the authors of the letter also call on the Dutch government to condemn publicly the Azerbaijani aggression and the overt demonstration of racism towards the Armenians. The delegation asked about the official Hague’s position on the Russian-Israeli blogger Alexander Lapshin’s extradition from Minsk at the request of the Azerbaijani authorities because of his visit to Artsakh. The delegation also informed Palm about the recent Azerbaijani requests for three members of the European Parliament, who visited Artsakh as observers in the Constitutional referendum. 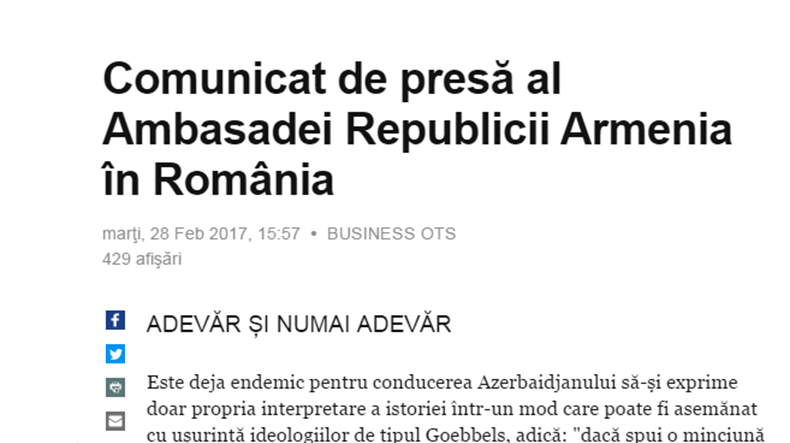 It is endemic for the leadership of Azerbaijan to voice only their own interpretation of history in a way that easily resembles to the Goebbels-like ideology: “if you tell a lie big enough and keep repeating it, people will eventually come to believe it,” statement of the Embassy of Armenia in Romania reads. Reportedly, since the waning years of the USSR, the people of the self-determined Nagorno-Karabakh have been fighting for the recognition of their status guaranteed by the international law. The lawful demands of the people of Artsakh to exercise their right to self-determination were met with anti-Armenian pogroms in the Azerbaijani city of Sumgait — 26 km away from Baku. Those events, carried out under the motto “Death to Armenians”, were the embodiment of Azerbaijani leadership's policy of xenophobia, ethnic cleansing and deportation of Armenians. “If official Baku's response to the aspiration of people of Nagorno-Karabakh to exercise its right to self-determination were pogroms and ethnic-cleansing of the Armenian population, the reaction to the implementation of that right in 1991, based on then existing USSR legislation and norms of international law was the large-scale war against the newly-independent Artsakh, accompanied by gross violations of the international humanitarian law,” the authors emphasize. According to the statement, exactly 25 years ago Azerbaijani Armed Forces commenced the months-long shelling of the capital of Nagorno-Karabakh — Stepanakert, which at that time had become a shelter for the refugees fleeing the pogroms in Sumgait, Baku and other cities in Azerbaijan. On February 13 of 1992, in violation of international conventions, Azerbaijan started using BM-21 “Grad” multi rocket launchers on the residential areas of Stepanakert. Khojaly was one of the seven firebases, used for the shelling of Stepanakert. Even back in Soviet time Khojaly had an important strategic importance, as it was situated on the crossroad connecting Stepanakert to other regions of Nagorno-Karabakh. Moreover, in 1970s the only airport of Nagorno-Karabakh was built next to Khojaly, which during the Artsakh's blockade was the single gate point to the outside world. Thus, by 1992 it became evident that the neutralization of Khojaly fire point was an imperative for the physical preservation of the population of both Stepanakert and Nagorno-Karabakh as a whole. The operation to neutralize the Khojaly fire point started on February 25, 1992. For months, the Nagorno-Karabakh self-defense forces had been informing the Azerbaijani side through all the possible means about this operation, its objectives and the humanitarian corridor left for the evacuation from Khojaly. “Azerbaijan continues to distort the facts surrounding the bloody events near the city of Aghdam, which they call the 'Khojaly tragedy'. The mere facts of those events raise many questions, and the Azerbaijani leaderships, even after 25 years, still prefers to keep the answers behind seven locks,” the statement reads. It comes as no surprise that there is zero tolerance in Azerbaijan towards the doubt, suspicion or investigative journalism on the official version of those events. Those who dare to speak openly about these events, were either killed like Cingiz Mustafaev, or imprisoned like journalist Eynulla Fatullayev, or exiled like the first President of Azerbaijan Ayaz Mutallibov. During the interview with Czech journalist Dana Mazalova published in April 1992 Mutallibov stated that the militia of the Azerbaijani National Front actively obstructed and actually prevented the evacuation of the local civilian population from the military operation zone through the mountain passages specifically left open by Karabakh Armenians. The hope and intention of the Azerbaijani opposition was to utilize civilian losses of such a magnitude to instigate a popular uprising against the Baku regime and seize the reins of power. “The Azerbaijani leadership has not answered yet to those questions raised by Azerbaijanis themselves. Meanwhile it has almost mastered the art of distorting the abovementioned facts in order to blame others for their crimes and escape the responsibility, while attempting to create a fictional counterbalance to the massacres that it has perpetrated against Armenians in Sumgait, Baku, Kirovabad, Maragha,” the authors write. The Sumgait events created a precedent of impunity and even of glorification for the killings of peaceful Armenian citizens, something we witnessed later on during Armenian massacres elsewhere in Azerbaijan. The leadership of Azerbaijan continues to inject hatred against Armenians. It encourages such crimes as the brutal murder of Gurgen Margaryan, who in 2004 was axed in his sleep by Ramil Safarov, when the two were enrolled in NATO training course in Budapest. The killer was later proclaimed a national hero of Azerbaijan. Even recently, during the April 2016 aggression against Artsakh, the world witnessed the results of the state-run policy of Armenophobia in Azerbaijan. The ISIS-style beheading of Kyaram Sloyan and two other Nagorno-Karabakh serviceman, or the brutal murder and mutilation of elderly family in Talish village, as well as the decoration of the perpetrators of these war crimes by the President of Azerbaijan is abhorrent and should be condemned by the whole international community.